The Missouri House has given the green light on proposed regulations that would allow rideshare companies like Uber and Lyft to expand their operations statewide. The measure received bi-partisan support with members voting 140-16 in favor of it. The bill would require the companies to pay a 5,000-annual operating fee, do background checks and vehicle inspections. Supporters, including Rep. Rick Brattin (R-Harrisonville), say the legislation would increase competition, jobs and affordability. “I just think this is a good common sense approach to setting out a framework to ensure that there is local control and the ability to have some say in it but not be able to outright ban people’s ability to make a living,” says Brattin. Rep. Gina Mitten (D-St. Louis) says the bill doesn’t go far enough. “If I call a taxicab and that taxicab discriminates against me for being a woman or a woman of color or someone with disabilities, I have a suit against both the taxicab company and the driver. Uber has consistently said they are not a company and they are not subject to lawsuit and that my only claim would be against the driver that may or may not even have sufficient insurance to cover my claim,” says Mitten. 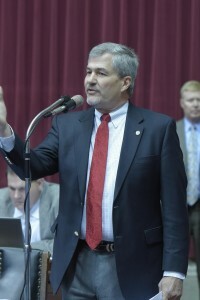 Rep. Jay Barnes (R-Jefferson City) says the measure doesn’t need to outline that discrimination is illegal. “There’s this thing called the Missouri Human Rights Act. It applies to every company that has public accommodations in the entire state. There’s a federal Civil Rights Act that also applies,” says Barnes. Opponents also contend that the measure would remove local control and lacks security measures, like requiring drivers to be fingerprinted. Rep. Judy Morgan (D-Kansas City) says the legislation could cost Missouri $51 million in federal funding. “By listing the TNC drivers as independent contractors, it would be putting us out of compliance with unemployment laws,” says Morgan. Of the 38 other states with similar regulations, bill sponsor Kirk Mathews (R-Pacific) says none have been in violation of unemployment laws. Uber currently operates in St. Louis, Kansas City, Columbia and Springfield. Lyft just began offering rides in Springfield. The next stop for the bill is the Senate.